WP-CLI – Command line interface Tool for WordPress Manage your WordPress Website From Command Lines. I am really Addicted to this Tool Because it saves My time by installing, Updating My plugins and themes without opening browsers. it is a Great tool for WP developers and Bloggers Who are all having bulk wp sites Manage everything from SSH. 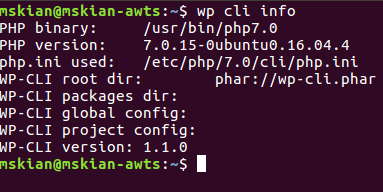 How to install WP-CLI on ubuntu? Hope this Guide will Help you to Install WP-CLI tool on Ubuntu if you have any doubts in Installation Just drop your comments Here I will Guide you.